Wasn’t planning to blog for a few days but then read something JAP wrote about Amitabh’s famous walk in films like Deewaar being inspired by Clint Eastwood’s in Dirty Harry. Well okay, but I prefer the copy to the original. Anyway, this got me thinking about the great walkers (no, Adam Gilchrist doesn’t feature here) and I reached, even in my enfeebled state, for my DVD of Kurosawa’s Yojimbo. If Yojimbo had never be made, the word “swagger” could comfortably have been pulled out of all dictionaries by now. The incomparable swaggerer here is, of course, Toshiro Mifune, whose performance as the nameless samurai in this film (and its sequel Sanjuro) created the palimpsest for Eastwood’s Man With No Name in Leone’s spaghetti westerns. The opening scene is an exercise in style. The samurai comes into the frame from the right (we don’t see his face), scratches the back of his neck in a coarse, throwaway manner, and begins walking forward magisterially, as the camera follows behind him at a respectful distance. And all this while the titles are still rolling (atypical for Kurosawa, who usually preferred to get the opening credits out of the way before the film began). This great tracking shot ends with the samurai reaching a break in the road, where two lanes lead in different directions. He throws a branch into the air and unhesitatingly walks down the path it indicates. Thus, with utmost economy, Kurosawa establishes that the protagonist is a wanderer with no ties, while also making a nod to the arbitrariness that governs so many human decisions. The town that the path leads to is caught between two feuding groups, each of which wants absolute control, and the focus of the story is how the amoral samurai sets about playing one side against the other until both groups have self-destructed. “The idea was about rivalry on both sides, and both sides are equally bad,” said Kurosawa, “Here we are, weakly caught in the middle, and it is impossible to choose between evils.” This can easily be related to the larger subtext surrounding the film – that it was made by a Japanese director at a time (1961) when the Cold War was at its peak, two superpowers holding a reluctant world hostage. Nowhere does this come across more strongly than in the superbly composed scene where the samurai, having professed his allegiance to one gang, brings the two groups face to face for a battle and then abdicates. He takes up a vantage point between the gangs and amusedly watches the cowardice hidden beneath all their bravado – they mostly stay where they are, shaking their weapons at each other pathetically, making ape sounds, advancing and retreating for quite some time before they actually get anywhere near each other. Yojimbo is one of my favourite Kurosawas, an enormously stylish, irreverent black comedy and – this isn’t noted often enough – a great musical too in its own way (in his book on the director, Donald Richie notes how ballet-like the film is and how the characters’ movements all seem to be choreographed). One memorable scenes follows another and even the briefest shots impress themselves into your mind: the cheerful-looking doggie trotting along, a human hand in its mouth, and the expression on Mifune’s face as he watches this; the coffin-maker who wants there to be more bloodshed so that his business improves – but then says ruefully at the end “When a battle gets too big, no one needs coffins anymore”. Dominating it all though is the Mifune walk, which is where this post began. Hungry tigers would flee, caterwauling, at his approach. Think it’s time to start a series on some of the great screen walks. Calling Henry Fonda next. In one comment on your blog, I had mentioned AB, Mifune and Steve McQueen. I think McQueen would definitely be one-up over the wimpy Henry Fonda (shudder). I also liked the singular walk displayed by Richard Roundtree in Shaft (the 71 version). Accompanied by the signature funky music, it was a class of its own. Mifune is my favorite actor of all time along with AB. Somehow I can't help feeling that Mifune embodied the persona of the character on the screen, whereas the writers of Indian cinema took the easy way out by making the character confirm to AB - especially post 1975. But my favorite Kurosawa film will always be a non-Mifune starrer - Kagemusha. Anyway, no one has run like Franka Potente, huh? Now, back to my Pinot Noir. Keep writing this stuff, mate. Cheers! "Wimpy Henry Fonda"???!!! Aaarrgghhh! (Now, in typical blogger/commenter style I'm going to home in obsessively on the one part of your post that I didn't like.) Fonda is one of my all-time favourites so take that back Quizman, take it back! Okay *swallows packet of tranquilisers* I probably gave the impression that I was classifying Fonda with Mifune and AB in terms of a macho, swaggering walk. That isn't the case. I love his walk for precisely the opposite reason - for how he used it (along with his poetic voice) to convey hesitance and uncertainty. Those two qualities defined his screen persona at a time when the standard macho roles were being played by John Wayne. Besides, not a fair comparison anyway: Fonda came from a completely different generation. He was a good 15 years senior to Mifune (apart from the cultural divide) and 25 years senior to McQueen, and that has to be accounted for. Henry Fonda's blue eyes. Those piercing like steel blue frickin' EYES!!! 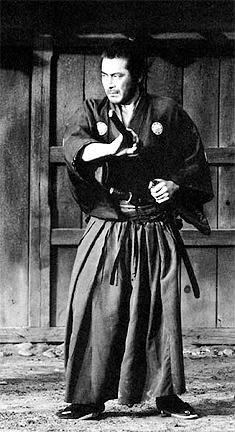 Can't no one match mifune's swagger, but the balletic theme of yojimbo had much to contribute too. I am loving your movie posts these days. Personally, I'd pick Mifune in Hidden Fortress over Mifune in Yojimbo / Sanjuro. The Yojimbo walk is more drawling - it radiates menace, true, but in a very raw, unwashed way. It's somewhere between the wild animal of Seven Samurai and Rashomon and the Hidden Fortress walk. The Hidden Fortress walk (and in fact, Mifune's whole bearing in the film) is grander, more regal, combining power with grace, energy with an almost balletic precision. You sit there wondering how the enemy soldiers cannot notice that this man is a great general even though he's disguised as a simple peasant. Just to watch Mifune step walk proudly into the centre of the enemy camp and watch the soldiers with their spears back away from him is to have a premonition (postmonition?) of what Homer's Achilles must have looked like. Joy, was it you who posted about Once upon a time in the west as a source for Sholay? Henry Fonda has menace in that (and his love-making with Claudia Cardinale is one of the hottest scenes ever). And Quizman, Roundtree as Shaft was fantastic too. Bookcoolie: thanks. Maybe this is your cue to start a blog called DVD-coolie! Falstaff: thanks for that input. I watched Hidden Fortress around 10 years ago when the Star Movies 100 Years of Cinema was on. Don't remember it all that well somehow (except for the comical twosome who served as George Lucas's inspiration for C3PO and R2D2! ), must watch it again soon. The love-making scene was tense alright, but hot? I think I read somewhere that both actors were very uncomfortable with it. Also, difficult as it is to believe, Fonda was 63 when he made that film (the guy was way fitter than even his daughter) and poor Claudia must've felt like she was making out with grandpa or something. But then, I seem to be the only person on earth (that I know) who seems to have really liked Dreams also...so I guess i'm all messed up. But my fav movie (if I had to pick), would be Ran. Kurosawa's use of Noh like masks to show different emotions, and specific characters to show different sides (Lady Kaede symbolizing revenge at all costs, and Lady Sue representing the path towards enlightenment, for example, and more so with the three brothers) was fantastic. I found it more moving than King Lear itself......and there's that moment, when the old lord Hidetora Ichimonji is left in the burning castle, and he can't find his sword to commit seppuku...so he sits, pale and ghost like, while the flames rage.....celluloid brilliance at its best. Anyways, Eastwood HAS a name in all atleast "TheGood The Bad The Ugly" It's 'Blondie' :) And I liked it, for the very fact that he has no real name, and hardly any lines. He speaks with his gun, and a twist of the hat, synchronised with the swirl of his cigar and a raised eyebrow. The camera and bkground score does the rest. JAP, curse be upon you. Why do you have to out that Fistful of Dollars was a copy? Everytime I come to know that one of my fav. movies is plagiarized, I sulk for days. It's theme is one of my all-time favorites. However I must also thank you and Jai. The time has come to get my lazy behind moving and watch all those Kurosawa classics. Jai, I didn't comment on it earlier. I immensely enjoyed yr reviews of Ray/Rai/Roy's(take yr pick) films, followed by insightful comments. It was a nice intro for non-Bong, non-filmi type like me. Will grab them one of these days. Which reminds me: Freshman year of college I did this huge media presentation on Sholay and its influences, which included clips from most of the spaghetti westerns and I did it in a Bollywood class. By the end, 15 Indian faces were staring at me in disbelief, and 15 white faces were staring at the 15 indians wondering why they looked sorta angry. But yeah, OUATW is definitely the largest influence on sholay. The theme of revenge, the deaths of the family during a bird shoot that leave only one member behind, and the harmonica. I don't think Gabbar was based on Henry Fonda though, at least not in his looks. Gabbar's look I believe comes from the villain Colonel Mortimer kills in Leone's a few dollars more. The same beard, and those gunbelts. I don't know if I've mentioned it before, but has anyone noticed how much gabbar looks like Fidel Castro, complete with communist clothing? So the subconscious story was that a bunch of urbanites come to a village to destroy a "people's socialist" on the orders of a feudal zamindar, but when one of the city-men dares to break the rules of the village (namely marrying a widow) he's (subconciously) killed?? Am i right or am i right people? That ties in with the original ending of Sholay where the feudal lord crushes the people's man beneath his spiked jooti like a gandi nali ka keeda. No? Anangbhai, I'll say it again - sometimes a cigar is just a cigar! Nice observation about the Castro similarity, but give the subcoonscious a break! I know i was just playin. Its something that just occurred to me. Oh and the train scene came out of the train fight from The Wild Bunch, although it wasn't a direct copy. Another thing I would like to say is that I harp a lot on indian films that have obvious influences, and dismiss them as substandard fares. But I think Sholay stands out because it was more inspired than a blatant rip off and it turned into a thing of its own. I've heard tell that Once upon a time in the West has over 300 references to Western films, and I'm in the process of tracking them down. I mean Leone started out as a blatant copy-er of kurosawa, but we don't dismiss him so easily because he grew beyond that. Look at Tarantino, Kill Bill has has about a thousand or more references to films QT likes. I mean every frame, every piece of clothing, every sound and piece of music is something QT heard and liked and made it his own. Btw, deewar was inspired by Haji Mastan a mumbai smuggler. I guess there are a few references to Dirty Harry there but I don't think it was something direct. The book on the making of Sholay by Anupama Chopra has all the details (including the inspirations behind each character). Apart from one claim*, everything in that book seems true. The inspiration behind Sholay was undoubtedly Seven Samurai, OUATITW and Mera Gaon Mera Desh. It was also made during the time JP had pardoned some notorious dacoits. Dacoity was much in the news in the early 70s and early 80s. I agree with Pruffock regarding Castro. Gabbar simply bought some old army castaways & wore them since he was told not to be a regular turbaned dacoit. Hey guys, thanks for these long comments. Much valued. Sunil: fret not. Though I prefer Yojimbo to Sanjuro myself, I have plenty of these thoroughly off-the-beaten-track views on films too. It's cool to be messed up! Anangbhai: ignore JAP. Love those over-interpretations. Am a big supporter of the idea that subconscious themes and motifs often work their way into a film regardless of what the scriptwriters/director consciously intended. Never trust the teller, trust the tale and all that jazz. JAP: a cigar is never just a cigar. It's whatever you want it to be. Ha! Anyway, coming back to Mifune, falstaff has made an excellent comment on him re The Hidden Fortress. You just know that he's a general. Who would've wanted to see Mifune as Obi Wan in Star Wars? Come on! Lucas totally considered having the guy, and Mifune learned english phonetically before Star Wars for Grand Prix. It would've totally rocked the film. Jai, loved the post. I thought Sholay was also inspired to a certain degree by Ford's Stagecoach, the mother of all westerns. Joy, about the subconscious: I already said it in a comment on Falstaff's previous post. And who would want to see Jaya's belly anyway? Her smile, yes, but for '70s belly, give me Aruna Irani any day. Now that was a babe with pizzazz who lost out to the treacly sweet demands of the viewing public. Jabberwock - this book was released last year. Thought you may be interested. I am currently reading it. iii. mifune again in 'red sun' with charles bronson. Excellent! Jackie Chan rocks too, though I maintain Mifune would knock him out in the first round of a fight, jokes or no jokes. Yojimbo is the definitive “Cool” movie. And Mifune one of the best actors to have graced the silver screen. And never mind what that idiot says about Jackie Chan… her idea of catching a good movie is to lie comfortably in bed (with a couple of pillows, of course) and catch up on her beauty sleep! She still harasses me from time to time to put on the Shaft DVD so she can see the last 45 minutes. Jackie Chan indeed! Sanjuro would make sushi out of him! Incidentally, the movie was inspired by (and acknowledged by Kurosawa) Dashiell Hammett’s Red Harvest, one of the most violent books I have ever read (a menacingly cold, matter-of-fact approach to bloodshed). It’s about the Continental Op (the protagonist of most of his stories) coming to Personville (‘Poisonville’, he’s heard a New York hood call the place, but isn't sure if it's because of the man's accent) to clean up the town for one of the bosses. Read it if you can, if you haven’t already. Oh by the way, she hasn’t seen the second half of Sanjuro either, among others! Came back to this post again as a Pleb. Sean Connery yes, but not in the Bond films. In "Red Sun" and "Entrapment" !